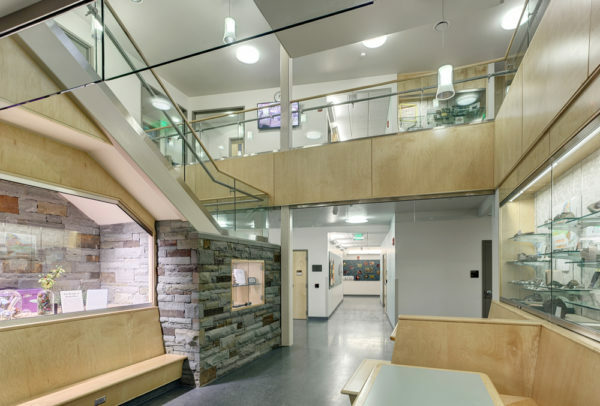 SUNY Broome’s new 48,000sf Natural Science Center promotes interdisciplinary study and consolidates Biology, Chemistry and Physical Sciences Labs, classrooms, and faculty offices into one building. An efficient organizational layout of the 17 highly flexible teaching labs, 5 Prep labs, and supporting classrooms provides the necessary flexibility to serve SUNY Broome’s expanding curriculum. A three-story central atrium links the Biology, Chemistry, Anthropology, and Physical Sciences departments, integrates professors with students, and offers views and connections to the rest of campus. The Natural Science Center achieved Silver certification by employing high performance building strategies and resulted in a 40% more efficient building than New York State’s aggressive Energy Conservation Code requires. In its prominent location and eye-catching appearance, the new building acts as a gateway to the college from the south.